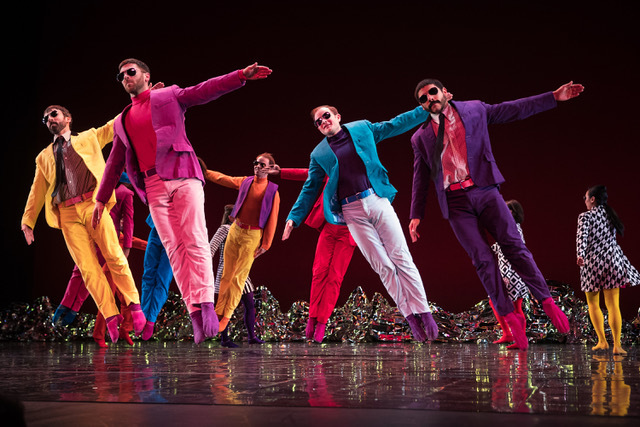 “Pepperland,” Mark Morris’ homage to the Beatles 50th anniversary of “Sgt Pepper’s Lonely Hearts Club Band”, is like falling inside a bubble gum machine where the colors are dayglo, the sugar addictive, at times too sweet, but always entertaining. “Pepperland” carries the colors of the 60’s through costumer Elizabeth Kurtzman’s mod fashion design of brightly colored mini skirts, and pencil-thin suits with skinny neckties made famous by the Beatles. Lighting designer Nick Kolin saturates the stage with equally complimentary brilliance of turquoise or purple backsplashes. As expected from Morris, the choreography is whimsical and witty, seemingly effortless, a kaleidoscope of psychedelic color of ever-changing chorus lines, reemerging groupings, running lifts, and repetitions of dancers being dragged from behind another dancer in leg splits as the lead dancers walks slowly downstage. Camaraderie abounds, as the dancers promenade in twos and groups with generous smiles and frequent shoulder hugs. 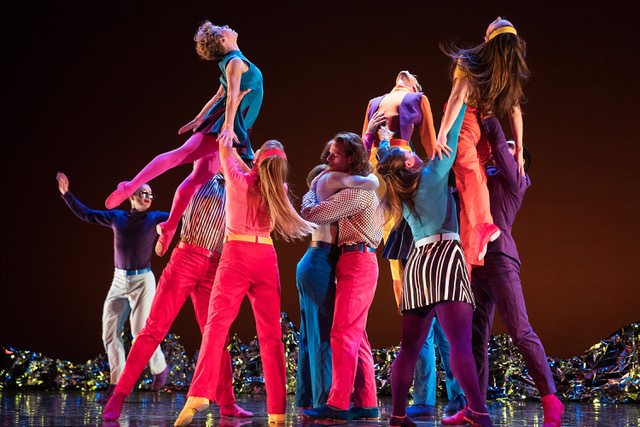 “Pepperland” is joyous, a gift in part from Cal Performances who has commissioned and co-commissioned Mark Morris for over 30 years. “Pepperland” is the 11th work of his they have funded that also includes, a residency, community classes and a film series that Morris curated at the Berkeley Art Museum and Pacific Film Archive; “Mark Morris Presents: In the Age of Pepperland.” Morris, an avid cinephile, thinks that the 60s were and “unbelievably productive and fertile decade for cinema” and will be present to introduce several films.